This is a very simple chocolate cake but I daresay it might be even better then my previous favorite. It is incredibly moist and so tender, with the perfect amount of chocolate flavor. It is a perfect cake to whip up when you don’t have time for a fussy recipe, and who needs fussy when simplicity brings such deliciousness? I hope you try it. Preheat oven to 350°. Grease a 13×9-in. baking pan, or spray with cooking oil. In a large bowl, whisk the first six ingredients. Stir in eggs, oil and buttermilk. Add water; stir until combined. Transfer batter to prepared pan. Bake 35-40 minutes or until a toothpick inserted in center comes out clean. Cool completely in pan on a wire rack. Frost cake. If desired, decorate with sprinkles. Chocolate Buttercream Frosting: In a large bowl, beat 1/2 cup softened butter until creamy. Beat in 2 cups confectioners’ sugar, 1/4 cup baking cocoa, 1-1/2 teaspoons vanilla extract and 3-4 tablespoons 2% milk (I used heavy cream) to achieve desired consistency. *Veronica’s notes: I sifted my dry ingredients since my cocoa powder was really lumpy. If you find yourself in the same boat, with big clumps of cocoa powder in the dry ingredients that won’t mix out, I would suggest sifting so you don’t have any clumps. Posted in Cake & Frosting and tagged best, cake, chocolate, easy, fast, one-bowl, quick, simple. Bookmark the permalink. Once upon a time I wrote posts 3-5 days out of the week and I felt like my readers were friends. I don’t know how many of you really even know me any more, it’s been so long since I’ve shared my heart (and recipes!) like I used to in the good ol’ days. Or even followed others’ blogs! I do miss that, but wouldn’t trade it for the time I now spend with my little homey. I wanted him my whole life, and blogging just isn’t as important to me right now. The days fly by and I know that soon this brief time in my life, raising the child I always wanted, will be over. I’m just soaking them up! But today my little guy is out of town for a sleepover with his grandparents, and I have some time all to myself, and I believe I’m way overdue for an update! Last time I blogged, I mentioned our fundraising efforts to afford the fertility treatments we need to give Joshua a sibling. I also mentioned professional photos and it’s about time I share those (which you can see two of them above) and update on the former! Our fundraising went very well and we are gearing up for our first IUI of this year. Several blog readers donated, some that were just stopping in for a random recipe and saw the fundraiser link, and I’m so grateful for this help, thank you. I have been going to a chiropractor since we started fundraising, and we’ve both done natural (herbal) things to help our fertility. A large percentage of the money raised, as well as money of our own, went to these natural treatments but it was money well spent. Quite a bit went into consultations, blood tests, fertility drugs (non-herbal), and sonograms as well. I’ve even been doing acupuncture in hopes to give myself an extra fertility boost! We got to a point where we were ready to move forward with an IUI and we needed one more fundraiser to meet our goal so we did a chili cook-off & silent auction. This was our most successful fundraiser (I also did a cupcake sale, a garage sale, and a Mary Kay party) and was also the easiest! So now we are excited and looking forward to the IUI, amazed how God has guided and blessed us through this journey, through family, friends, and even strangers. Taking heart that this is the path we were meant to take, and hoping for a positive outcome, though we know that is not a guarantee. No one knows that more than us. After thirteen years to get our son, and a failed IUI last year, we know. I still can’t help but be very hopeful, as I’ve never been on this many drugs (for fertility) before, LOL! Oh boy, time has really gotten away from me. I can’t believe my last post was in September! I wanted to post our professional photos we had done for Christmas, then realized I hadn’t even shared about Joshua’s birthday so I better do that first. He turned two on November 23rd! This little guy is very into trains. I can’t even tell you the number of times I hear “choo choo!” a day, either because he hears a train, sees a train track, is playing with trains, or sees Thomas on his socks & pajamas, or on TV. He finds trains everywhere, like on a Christmas tree figurine I never even noticed a train was at the base of, or in the background of pictures in books. You never know how surrounded you are by trains until you have a toddler signaling their presence once every few minutes. Needless to say, we went with a Thomas the Train theme for his birthday this year. This was his Halloween costume, and the photos worked nicely for his birthday invitations. I saw a really cool cupcake train idea on A Britt Without Boys (see her post for a much better train, and tutorial), and was really excited to make it. It was very simple to put together and while mine didn’t look as great as Brittney’s, everyone loved it and it was a hit! Basically you need a large engine to start the train off with, if you want to go with Thomas I’d look into the “My First Thomas” set you can get at Target for around $20. I went with a projector toy I found on eBay that was a bit too small, and I’m not sure the My First Thomas is bigger but it seemed to be in the online pictures. Then you need cupcakes, the number is up to you. You need half as many graham crackers as cupcakes, and 4 large marshmallows and Oreo’s per graham cracker. “Glue” marshmallows with melted chocolate (I used a disposable piping bag that I melted white chocolate chips in the microwave) onto the bottom of the graham crackers where you want the tires to be. Place them marshmallow side down and then glue Oreo’s over the outside of each marshmallow to make them look more like train wheels. To set up the train, arrange two cupcakes per graham cracker and set up in a line behind the engine. Add candles and you’re done! I got the “Happy Birthday” candle set for $1 at Dollar Tree. He started out dressed in his train engineer costume but HAD to put on the Thomas jammies from Auntie Joan as soon as they were out of the gift bag! I didn’t get too crazy with the decorations, just cheap stuff in basic colors that went with the Thomas theme, but I did put some creativity into the favor bags. I got blue paper bags 3/$1 at Walmart, then designed my own labels for them and stuck them on with double sided tape. I include a wooden train whistle ($1 at Dollar Tree), Train Smoke (Vanilla Snow Cotton Candy, $1 from Dollar Tree, filled 6 bags), bubbles (8-pack of wedding bubbles $1 at Dollar Tree, printed out my own Thomas’s and taped them on), and a few fun-size candy bars that I got half price after Halloween. What can I say, I’m thrifty! And this was the front of the thank-you cards I designed and mailed to those who gave him a gift. I print my “cards” at Walmart as 4×6 photos for about a quarter each with tax (for 1 hour, only 9 cents if you can wait for home delivery). If it’s just a card front like this, I cut out some card stock to size, fold it, and tape the picture to the front, then write a message inside. Can’t beat a personalized card for a quarter! Oh and one more cute thing from the party, my Mother-in-Law, with the help of her artistic sister, made this Thomas veggie train with a cardboard Thomas they made “from scratch” and long baskets (I’ve seen these at Dollar Tree, like MIL, like DIL!) filled with veggies. It looked much cooler spread out until I pushed it aside to make way for my big crock pot full of Easy White Chicken Chili, but you get the idea. I didn’t do any games but had a coloring table set up just in case there were slow points and children got bored, but it actually ended up being filled with all adults! My sisters joined after I took this picture. I printed this Thomas Birthday Express coloring sheet and they went to town while they waited for everyone to finish eating and the presents to begin. I purposely kept the decorating and prep to a minimum to avoid stress and it was a really enjoyable party! I wonder how many more years I’ll be able to continue my cake strike before this little boy starts working on me and convinces me to make a dragon cake like his cousin did once upon a time. For now, I’m enjoying cupcaking it up! hehe. 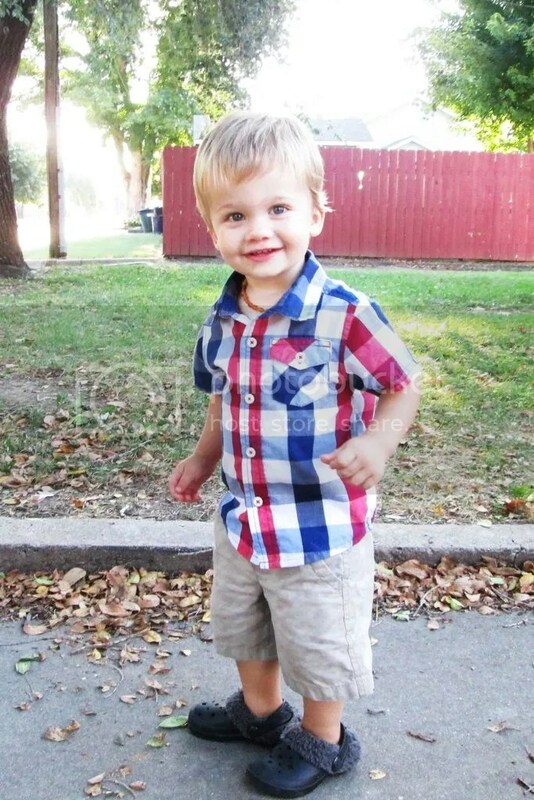 Posted in Joshua, Uncategorized and tagged birthday, cupcake, Thomas the Train, thrifty. Bookmark the permalink. Velvet Banana Bread – my blue ribbon winner! It all started in 2009 when I entered the foods competitions at the Kansas State Fair for the first time, and met a wonderful & talented woman named Colleen Woker. We met while watching the pie judging and I asked her if she’d won any ribbons in the other competitions. She listed off approximately 241 things she’d placed in, including getting “Best in Show” for her banana bread, which as far as I understand means that her banana bread was so good, that the judges deemed it better than anything else submitted for judging in the foods competitions. I mean, it beat cakes! CAKES! I was so impressed by her and in that moment, knew that some day I had to get myself a blue ribbon in the banana bread competition. Little did I know it would become nearly an obsession. In my quest to win a blue ribbon, I’ve made over fifty different banana bread recipes, and no matter how hard I tried to find the best, most perfect banana bread, the highest I ever placed was 3rd. I really thought I was doomed to never get my blue ribbon, or even a red one. This year I had no idea what recipe I was going to make until the day before the competition. In fact, I had even forgotten to buy bananas in advance to let them get super duper ripe, and all I had was bananas that were still green at the stems. Not acceptable! I posted a last minute plea on Facebook for rotten bananas and was given some by two wonderful women (thank you Lacey & Lisa! ), enough to make a practice loaf or two if I could find the time. I decided to take my best good friend, Jackie‘s, advice and replace the pumpkin in my most favoritest pumpkin bread recipe with bananas, which she has been doing for a year. That recipe has 1/2 cup of water in it, which I’d never ever seen in all the banana bread recipes I’ve read in my search for the perfect one, and I was so scared to try it. I asked her probably five times, “Do you really put the water in it when you make it? REALLY?” She assured me she did, and that it wasn’t wet or gummy, but really similar in texture to the pumpkin bread. That sold me, because that soft texture is the ultimate for me in a quick bread. Despite my deep fears of including the water, and the temptation to replace it with something more exciting like milk or pineapple juice, I gave her idea a go, adding a touch of cardamom, and was absolutely floored by the result. I had never in my life had such tender, soft banana bread. And so delicious, sweet & perfectly banana-y with a the perfect balance of spices to set it off. Unfortunately, it was one of the uglier loaves I’d ever made, and since 25% of the judging score was based on appearance, I lost all hope right there. Because I knew it was too good not to submit, but also knew it was too ugly to win a blue ribbon. I just hoped it was good enough to win a red. So many things went wrong in making the official loaf and my spirits sunk deeper and deeper with each obstacle. I kept questioning why I was even bothering. This wasn’t the regular little banana bread competition, this one was sponsored by King Arthur Flour and the first place prize was a $150 gift card to their catalog, which is much bigger than the usual $9 prize. This was a big deal, and more people would be entering than usual. I didn’t have a chance! 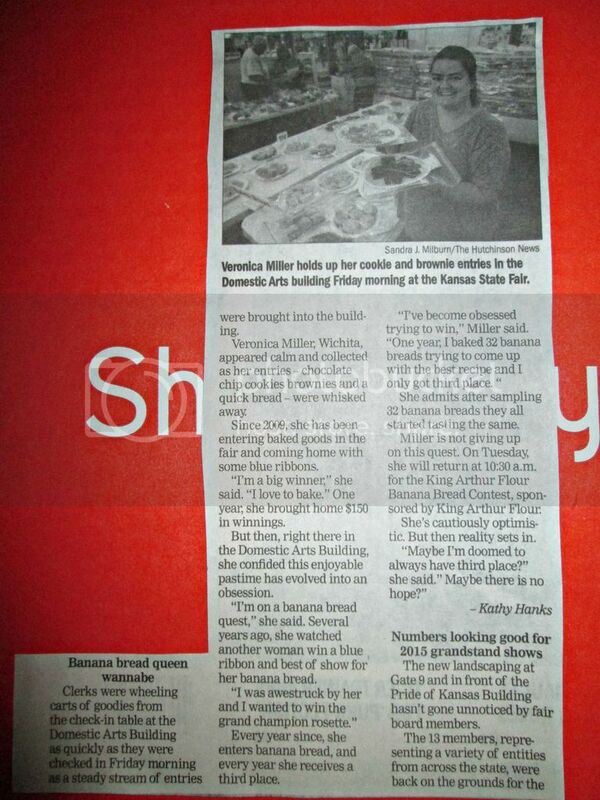 I was exhausted, would have loved to sleep in the next morning, didn’t want to waste the gas or the effort when I knew it was hopeless, but I’d been in the paper about the being the Banana Bread Queen Wannabe, and everyone on Facebook knew about it. I had to go. When I arrived to submit my bread, I noticed that everyone around me had loaves that were the same dark shiny brown, which I found unattractive. That made me feel a little better, until I looked to see if any of my other three baked goods I’d already turned in had placed, and they hadn’t. I knew it was going to be my very first no-ribbon year, and I went home defeated, knowing my quest might never end. But when we returned to the fair as a family two days later, there it was. My ugly brown banana bread sitting front and center. Next to a blue ribbon. I squealed. I hopped around. I squealed and hopped some more. I think there was a lot of, “I can’t believe it! !” I gushed my entire banana bread story to the poor couple standing nearby when my freak out started. They were so happy for me, but everyone else looked pretty perturbed & disturbed by my antics. I stopped myself several times from running up to random people to tell them I won. Joshua was grinning and giggling, clearly trying to figure out what had Mom so excited. I took his hands and we did a little celebration dance together. When Dennis approached us (he’d been in the bathroom), I wanted to let him discover it on his own but I just couldn’t contain myself and as soon as I saw him I beamed and jumped up and down and waved him over, pointing wildly at the display case where my winning bread resided. He knew instantly of course what that meant, and he hopped up and down with me a little in celebration. Joshua was so happy to see all the happiness and I was so happy, and Dennis was so happy, I thought all our heads might explode. It took six years and countless loaves of banana bread, but I did it. The blue ribbon is MINE! Thanks be to God, to Jackie, Lisa, Lacey, and to Colleen for not entering the banana bread competition this year and giving me a chance. And to everyone who has rooted for me all these years, thank you!! My quest is complete and I couldn’t be happier to have found my very favorite recipe for banana bread and gotten the blue for it so that I never have to try another recipe again. I’m so DONE with new banana bread recipes. This one is definitely my new favorite, and I truly may never make another recipe again. Preheat oven to 350F. In a large mixing bowl, combine banana, sugar, vegetable oil, water, and eggs. Whisk until well mixed. Measure the flour, baking soda, cinnamon, salt, baking powder, nutmeg, and cloves into a separate bowl and stir until combined. Slowly add the dry ingredients to the banana mixture, beating until smooth. Mixture will be very very thin and it’s OK to mix until no flour streaks remain, but if you see little lumps of flour that won’t mix out, don’t sweat it, they will dissolve while baking and overmixing will make this tender loaf tough and dry. Spray the bottom of a 9×5 loaf pan and pour batter in (if your pan sticks, go ahead and grease the whole thing). Bake for 60-70 minutes or until a toothpick inserted in center comes out clean. Immediately remove from pan, and cool at least 15 minutes before slicing. Remove from pan immediately and allow to cool at least 15 minutes on a wire rack before slicing. Cool completely before wrapping leftovers in plastic wrap. Veronica’s notes: If you aren’t measuring your ingredients on a scale, please use a very light hand when measuring the flour, spooning it gently into the cup and not packing it at all before leveling it. Also, I only left the sides of my pan ungreased because the state fair judges have disqualified me in the past for greasing the whole pan. According to them, this is a baking sin and the sides of your bread will be much more tender if you grease only the bottom. This works fine with my new nifty galifty USA Loaf Pan because it’s crazy nonstick, but if you have any other not fabulously non-stick pan, you’d better go ahead and grease the sides. I honestly can’t tell a difference in the finished loaf whether the sides have been greased or not, the judges need to chill. Speaking of loaf pans, be sure to use a large 9×5 as this is too much batter for an 8×4 loaf pan. If you only have a small loaf pan, make some muffins with the extra batter, but don’t fill your pan more than 3/4 full. Lastly, if you overbake your loaf a bit (I did on the one photographed, by a couple minutes because I was busy when the timer went off), don’t forget my water trick. It works on quick breads as well as cakes! Spray the sides and bottom well with water, don’t be shy with it, and it will all absorb while cooling and soften those hardened edges right up. Posted in Bread, Sweets and tagged baking, banana bread, best, blue ribbon, holiday, holidays, King Arthur Flour, moist, recipe, satin, soft, spice, tender, velvet. Bookmark the permalink. I won! THE BLUE RIBBON IS MIIIIIIINE! I WON! I WON! I WON! I won the King Arthur Flour Banana Bread Competition at the Kansas State Fair! 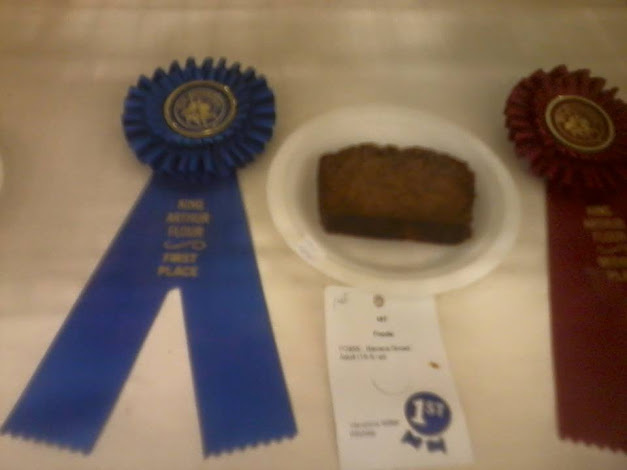 I think after six years and over fifty different banana bread recipes tried, I’ve earned the right to yell a little about FINALLY WINNING A BLUE RIBBON!!! The curse has been lifted! LOL! I know the photo is horrible and you can’t even see my name, but I will have better photos (from a friend who’s going to the fair tomorrow, I forgot my camera and had to use my horrible camera phone) and a recipe for you next week!! In the mean time, I’m going to spend the weekend doing a celebratory dance on the rooftop. Ha! Posted in Announcements & Awards and tagged banana bread, blue ribbon, competition, Kansas, King Arthur Flour, state fair. Bookmark the permalink. Well my weekly posting was short-lived, but life has been a whirlwind lately. Look how much my boy has grown up since I last posted! Can you even believe he’s the same baby I introduced you guys to less than two years ago? Time just FLIES when you’re having fun, and I’m enjoying every fleeting second. In other news, I was interviewed after dropping off my (whopping three) baked goods at the fair this year, and ended up in the Hutchinson newspaper on Saturday. If you click the photo you can enlarge it to read it if you like. So now everyone knows I’m just a wannabe. Ha!! And by the way, it’s not true that I place 3rd every year. I’ve placed 3rd twice (for my Favorite Banana Bread and Black Walnut Banana Bread), and didn’t place at all the other times. So yeah, pretty much doomed. It’s also not true that I’m “cautiously optimistic,” as I have no hope for placing with the banana bread competition this year. In fact, I have no idea what recipe I’m even going to make even though I have to make it today. But I’m entering anyway. Pretty sure I’ll be doing this until I die, I’m all in and can’t stop now, even if it feels foolhardy and a time waste at this point. LOL! For new readers, you can see all about my banana bread journey here. 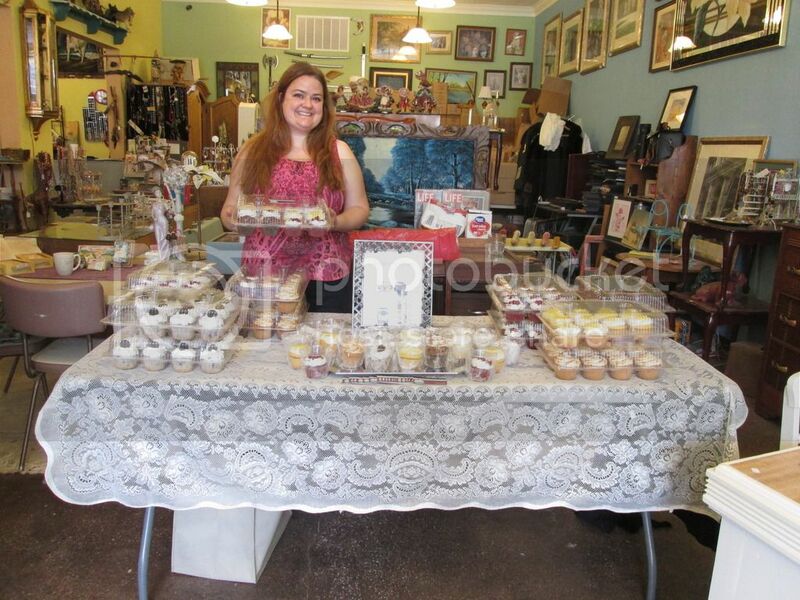 We’ve also decided to do some fundraising to try and give our son a sibling, and I raised $320 (profit) selling a ton of cupcakes at my sister’s shop recently, and am currently organizing a garage sale that will be mainly donated items. My wonderful friend, Holly, started a Gofundme page for us that you can check out here if you want the scoop. Joshua is currently recovering from his first bout with strep throat, which has been hard on all of us. Thankfully he loves his medicine and is doing so much better already. It is so hard seeing your baby in so much pain, and I was so relieved when the doc said it was strep. If it had been a virus we just had to ride out, I don’t know what I would have done with myself. I was about to lose it, because nothing I did was enough to make him feel better, not the Motrin every four hours, not the Hyland’s cough syrup, not diffusing Thieves oil, not feeding him fresh pineapple, and he could hardly stand to eat and drink so he lost his baby fat again. (He had the stomach flu at the beginning of the year and couldn’t eat for almost a week, that was the first time he lost it.) So everyone is much happier now, and we’re all trying to catch up on lost sleep. Hopefully Joshua will be eating like a pig soon and getting back the little thigh rolls I adore so much.